Is Comet Hartley 2 beginning to brighten? 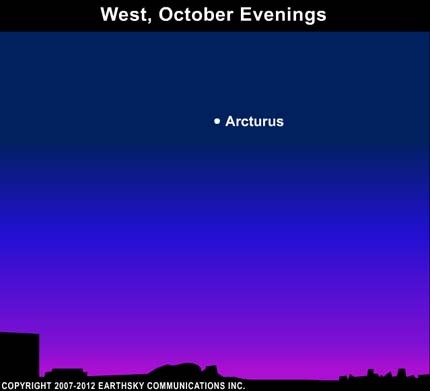 A bright star in the west in the evening in October – flashing colors – is Arcturus. Jim, every year at this time, we get questions about three different stars that are flashing different colors. One is Capella in the constellation Auriga the Charioteer, which is now in the northeast in mid-evening. One is Sirius in the constellation Canis Major the Greater Dog, which is now in the south before dawn. The third is the one you are asking about, Jim, in the west to northwest after sunset. This star is Arcturus in the constellation Bootes the Herdsman. Its flashing colors for the same reason Sirius and Capella are . . . because all three of these stars are bright and, at this time of year, noticeably low in the sky. When you see an object low in the sky, you are seeing it through a greater thickness of atmosphere than when it’s overhead. 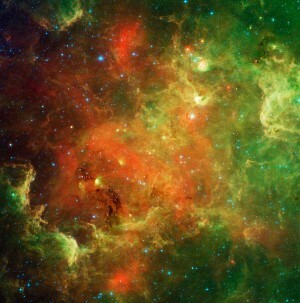 The atmosphere refracts or splits the stars’ light to cause the colorful flashing you observed, Jim. At mid-northern latitudes, scintillating Arcturus adorns the western evening sky all through October.